Debbie Beere at Dbeere Yachts tells me of a €600,000 price drop on the 29m Ferretti Custom Line motor yacht Gemini. Gemini has seen only one owner and captain since new in 2004 with no expense spared in her upkeep and maintenance programme. The owner’s cabin is on the main deck, and there's an enormous garage to stow all water toys. There is also a VIP and two twin cabins giving total accommodation for 10 guests. Twin 2000hp MTU engines give her a cruising speed of 26 knots. 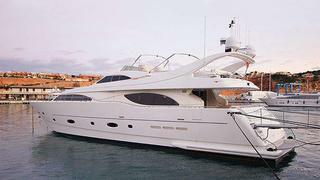 Lying in Majorca, Gemini is down from €3.35 million to €2.75 million.